Join us at the Texas Motor Speedway for race #2 of the RCDRL Texas division points CHAMPIONSHIP series! 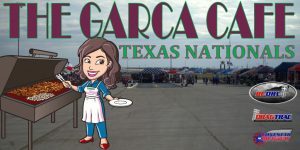 Chef Tommie Garca and her grill skills will be heating up the return road, while we burn up the Lonestar RC Dragway with some Fast Furious Family Fun March 17, 2018 starting at 8am. The RCDRL Podcast Show Episode #39 The Shipman Brothers Are Back Again! The RCDRL Welcomes JConcepts.net to the 2018 Season!